Photopolymerization of thin monomer films can be used to manufacture parts rapidly, but can lead to gradients of elastic modulus, particularly when the film is illuminated from only one side. In order to better understand the relationship between film curing (expressed in terms of carbon–carbon double bonds, C=C) and mechanical properties, a model was developed and tested against experimental results. The example system used in this work was a thin film microfluidics chip made from a multifunctional acrylate monomer. An 800-micron monomer film containing a photoinitiator was illuminated from the top surface, producing a solid chip. The C=C content and mechanical properties of the chip were measured at multiple positions over the cross sections. Raman spectroscopy was used to measure local C=C concentrations, and nanoindentation was used to measure local Young’s modulus and hardness. Spatial gradients in monomer conversion, Young’s modulus, and hardness were measured on a series of chips manufactured at different light doses. A photopolymerization model was used to fit the Raman data, providing quantitative predictions of the monomer conversion as a function of film depth and light dose. These data were then correlated with the values of Young’s modulus and hardness. The correlation between the photopolymerization and the mechanical properties can be used to optimize the mechanical properties of thin films within the manufacturing and energy constraints and should be scalable to other multifunctional monomer systems. 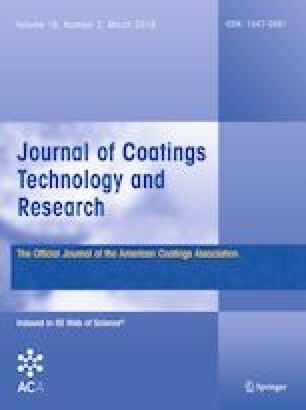 Presented at the 2018 American Coatings Conference, April 9–11, in Indianapolis, IN. The authors gratefully acknowledge the financial support from Hummingbird Nano, Inc., NSF SBIR Phase II #1555996 (National Science Foundation). Thanks to Freddy Arce and Patrick Marsac for the use of the Raman spectrometer. Also, thanks to Yikai Wang and Yang-Tse Cheng for nanoindentation assistance.